We currently have 10% off our Luxaflex (base plus) awning range + a free wind sensor with all electrically operated awnings. 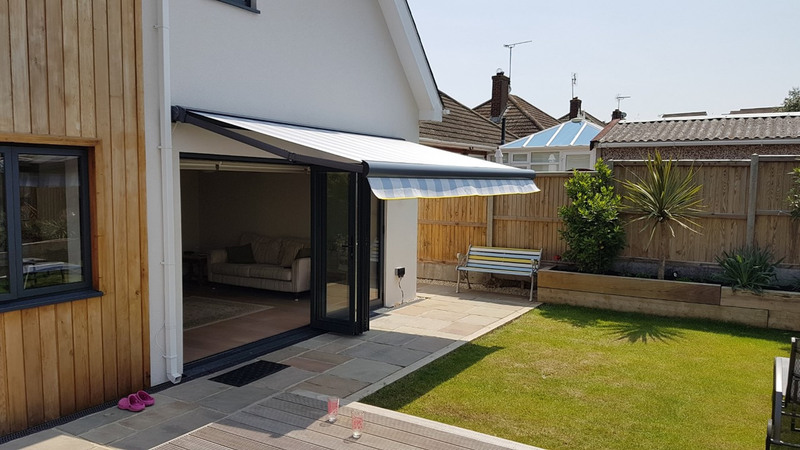 Enjoy your garden & enhance your home with a new Luxaflex® awning. 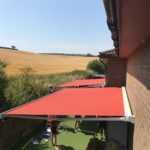 Our awnings provide perfect shade to keep you cool on the hottest days whilst enabling the use of your patio even when the weather is less than ideal. The patio becomes an extension to your home. Imagine being able to dine outside with friends or family on a warm summer evening or even in showery weather. Awnings also provide protection from fading for carpets and soft furnishings without having to draw the curtains and lose your view. Control the light & add character to your windows. Extend your enjoyment of ‘al fresco’ evenings by adding controllable heat and light. We are currently offering a free blinds safety check for any domestic or commercial property. We will use a risk assessment and give you recommendations on how to make your home or workplace safe and update to date with current blind standards. The Make it Safe campaign was launched by the British Blind and Shutter Association to help to prevent tragic accidents occurring involving individuals becoming tangled in blind cords. This is not just a domestic issue, as commercial buildings also need to ensure they are taking note of the guidance given by the campaign – in particular, schools and offices where young children may be brought in by clients need to comply with its advice. Manufacturers now need to fit safety devices on window coverings, cords and chains before selling them. This gives facilities manager’s greater peace of mind that the blinds they are purchasing for their workplaces are of the highest standard with regard to health and safety. For buildings with older blinds that may not need replacing, but that need to be made safer to comply with new standards, the Make it Safe campaign recommends several devices that can be used to prevent cords from becoming tangled. These include chain-break connectors that will cause a cord to snap in the event that excessive pressure is placed on it, while cleats and chain fasteners can be used to wind the cord around after each use of the blinds, helping to keep it out of the way in a tidy and safe manner.